Dreaming a world – Hello Korea ! Live here in Korea, meet the unwed mothers, and you learn quickly that the most backwards thing about this place is social services to women being ignored in favor of sending babies to other countries. As long as adoption agencies offer this convenient way to hide family shame, why should society bother to change? International adoption contributes to the perpetuation of the problem, instead of helping solve anything. Their token responses to this criticism are not enough. Read these women’s stories: They’re not just statistics, but real living, loving, deserving, human beings. Humans that deserve a chance. 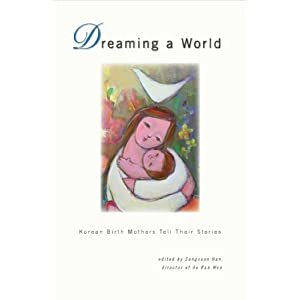 “Dreaming a World: Korean Birth Mothers Tell Their Stories is a wonderful new follow-up to I Wish for You a Beautiful Life. A powerful follow-up to I Wish for You a Beautiful Life, this new book gives voice to seventeen Korean birth mothers, who tell their stories looking back from the present to the time they were pregnant and gave birth. They describe their situations then, the decisions they had to make, and their lives in the time since. What they have to tell us is both heart-breaking and compelling, from voices seldom heard. Good book. I have it and look at it every now and then. This one showed up on the night stand recently. Brings about bouts of “Oh my God” and goosebumps to realize what we have been a part of. My wife just had a great idea. For mother’s day we will donate to Ae Ran Won and similar organizations rather than spend the money on gifts for ourselves. now if we can just get people to stop supporting adoption agencies (the trash can) and instead support families in crisis (the supposed trash) the world would be a better place.